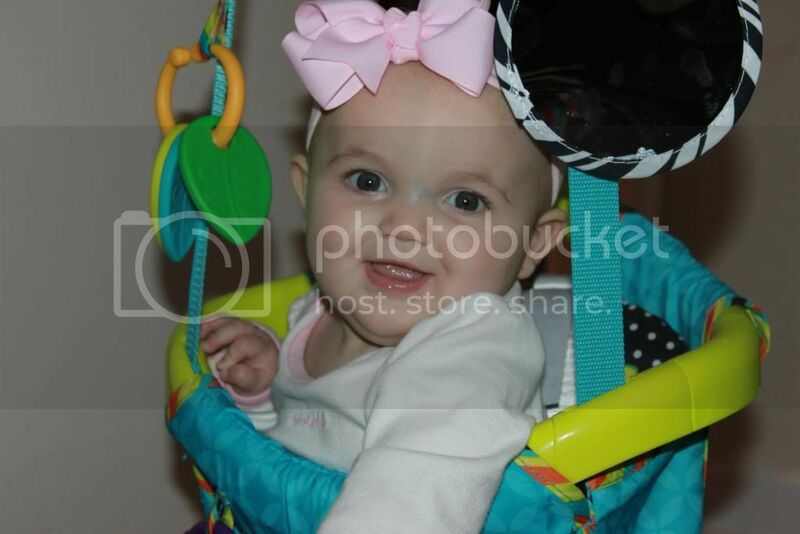 A few months ago, the kind people at Bright Starts sent Laney their Bouncin' Around™ Door Jumper. It's been hanging out in her closet just waiting for her to grow a little bit more and wouldn't you know it, all too fast...she did! Now that she's about to be six months old (as of Friday!) 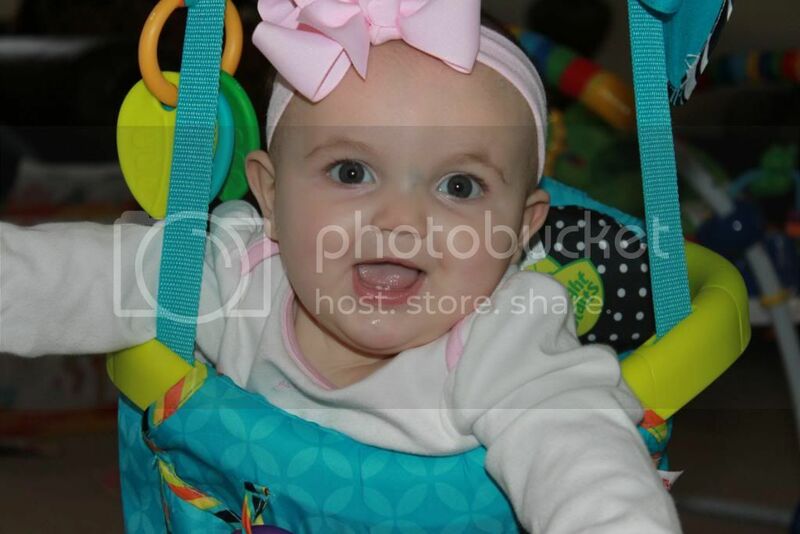 she is finally ready to use her Bright Starts Bouncin' Around™ Door Jumper! Once I had The Bouncin' Around™ Door Jumper assembled, I attached it to our door frame and my little tester was all too happy to give it a whirl. 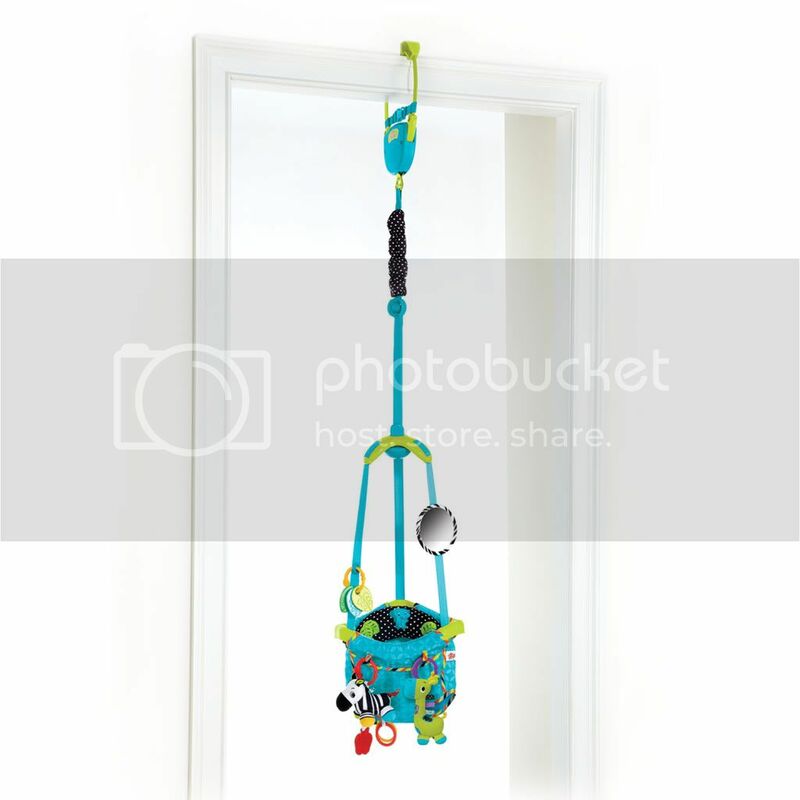 This door jumper provides hours of bouncing fun for baby! The 4 playtime toys including a plush zebra and giraffe, teethers, and mirror, will also entertain baby while jumping. The straps are adjustable for use as baby grows, and the Support Me Pillow™ provides extra support for smaller babies. The playtime toys are in the perfect position for her to grasp and actually be able to "play" with them. We've tried other jumpers before that had the accessories so far out of reach, they were more like decorations than toys. 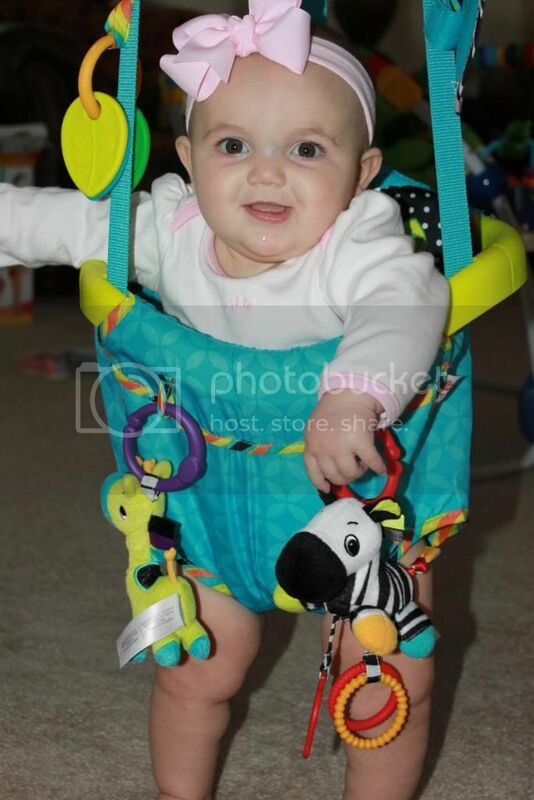 The easily adjustable straps made it super simple to lower or raise the jumper to the perfect height for Laney. The Bouncin' Around™ Door Jumper also came with easy to understand directions and diagrams that showed exactly how she should be positioned in the jumper. 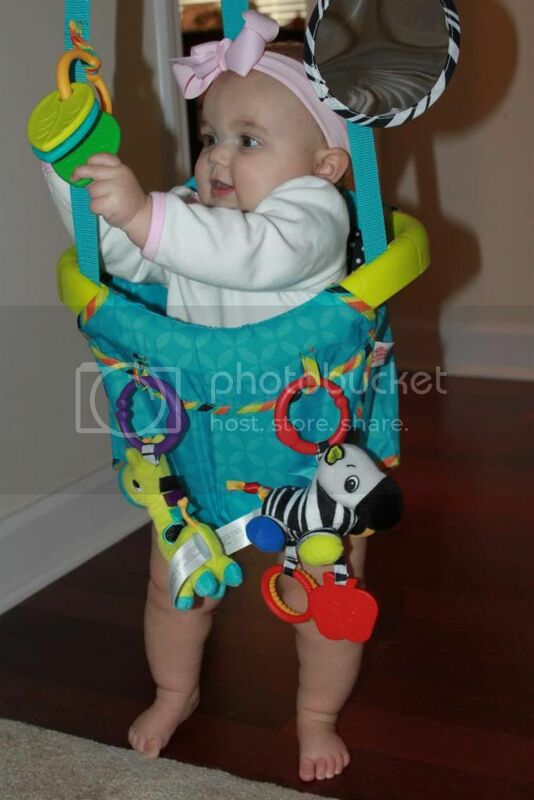 The Bouncin' Around™ Door Jumper is the perfect fit for our little Laney girl and she definitely enjoyed the time she spent bouncin' around! 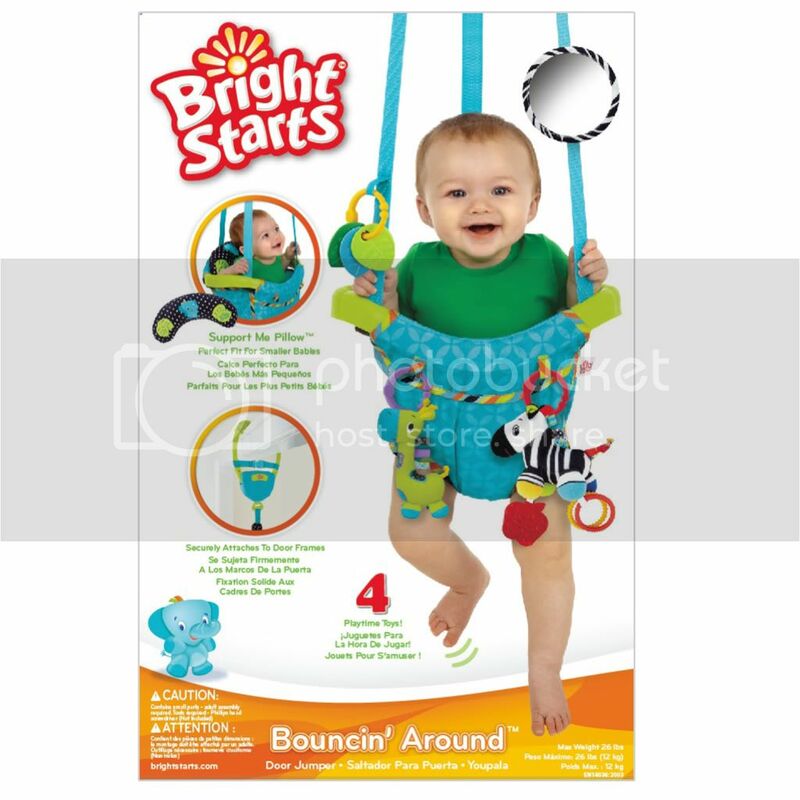 Would you like to win a Bright Starts Bouncin' Around™ Door Jumper of your own??? It would be perfect for your little one or even as a gift for any little one in your life. The Holidays are coming up and The Bouncin' Around™ Door Jumper would make a great gift! For an additional entry, "like" Bright Starts on facebook (click HERE to go to their FB Page) and come back and leave another comment letting me know that you did. Two easy steps and you've got two chances to win a Bouncin' Around™ Door Jumper of your own! The giveaway will end on Sunday, November 13th at 9pm EST. I will use random.org to pick a winner. Thanks to Bright Starts for sponsoring this giveaway!